What would yall consider to be expected prop slip for a lightly loaded, riveted 1648 flat bottom with a 9.9 or 15 hp motor? I'm asking because I have this boat paired with a 1982 9.9hp Evinrude and am seeing prop slip anywhere from 20-25%. This is based off inputs of 5400 max rpms, 2.42 gear ratio, 10" pitch prop, and top speeds of 16-17 mph. You can see the exact boat in the link in my signature. The previous numbers listed came from a load consisting of me at 170 lbs, 6 gallons of fuel, group 29 battery (placed up front), bow mount TM, front pedestal seat/hardware, and a removable rubber floor at maybe 70 lbs. I understand it is not an exact science due to the number of variables, but I would like some input on if my slippage numbers are probably typical for my rig or not. I plan to do all I can to make it better including adding a manual jackplate to raise my anti-vent plate as it is an inch or so below the bottom now, converting the 9.9 to a 15hp for more rpms which may help get on plane better providing better efficiency, and re-propping as necessary. There's a slew of variables to prop slip....and if you've still got the stock weedless prop, chances are good that it's probably about normal at 25%. There aren't very many people or companies that make "good" props for the 9.9 and 15, at least to my knowledge. Maybe Ron Hill but you'll pay dearly. Yeah, it's a stock 9.25x10 3 blade prop. There are few props available for this motor ranging from 8 to 11, including the Solas Amita, Turning Point Hustler, Quicksilver, and Michigan Wheel 3 blades. Solas also has a 4 blade model. I know the are all basic props but may be better than OEM. Would the 4 blade one be worth looking into? Can the extra "grip" they provide also decrease slip or is it a given it would decrease both speed and rpms? I had a slip issue with my prop with my RPMs on the max end of the recommended range & the prop shop I took the prop to suggested adding a cupped edge to my existing prop before I try monkeying around with changing propellers - worked very well. Cut my slippage from 36% to 20% on my (as loaded rather weighty) 1436. Dunno how that compares to a 1648 -- but perhaps if people use a slip calculator with their speed, prop & RPM specs they'd be able to give you an idea of the slip they're seeing. 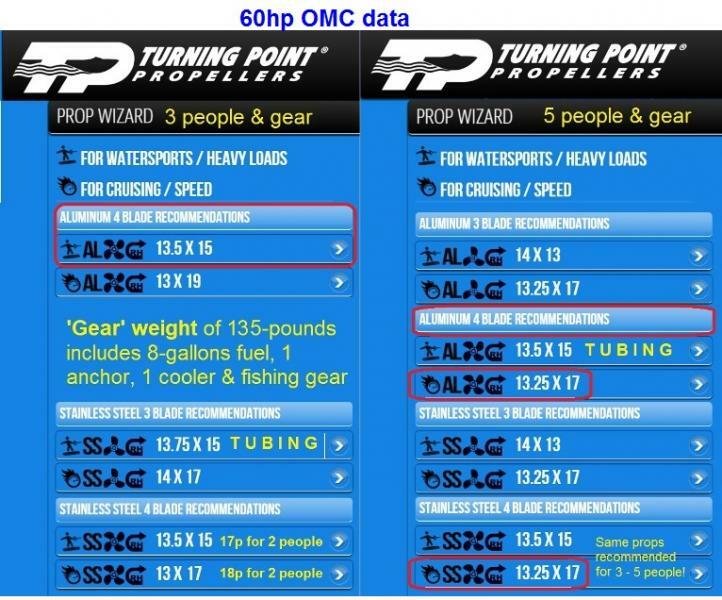 FWIW I ran your numbers ... via Mercury's prop slip calculators they had that 9.9hp Evinrude at 20% and via the Turning Point website 'prop calculator', for that motor and a Lund 1648 hull (only comparable I could find) they recommended the props are per attached - 9" and 10" pitch props. Factoid - More aggressively and efficiently designed propellers will slip less. Sadly, there are not available with low HP motors ... less custom tweaks by a prop shop as OnTheWater102 advised. I'm getting 10% slip (theoretical speed 40mph, actual speed realized 36mph) on my 60hp motor, mounted on a heavy deep-V tin hull ... but I am intentionally running a lower-pitched prop than recommended (for when there are only 1 or 2 aboard) as I want to ensure that I have power band/torque/RPMs available for when I take 4 or 5 adults down to the beaches. IMHO you might want to find a used 9" pitch prop to try out. You will lose some top-end, but it would be better for the motor and loading if/when someone else goes with you or you increase your load, but I didn't run the numbers for a heavier load. The beauty of that 'prop calculator' I keep referring Tin Boaters to ... is that you can keep the data set the same (same hull, OB, number of trolling motors, batteries, fuel, etc.) ... and just hit the 'back' key and change your load carried, i.e., 2 to 3 versus 1 person or whatever, and thus see the effects of load on your prop choices. Also attached are the variations in "persons carried" that I used to settle on my choice for an all-around prop. Even though the OB has a rev limiter, I know I need to dial it back when just running by myself or when fishing with others. In my experience ... the absolute worst thing you can do to an OB motor - besides not adding any oil - is to lug it and run too steep or too high a pitched prop. Second issue - I don't know how reliable this compilation is, but I keep this website http://www.kirschbaum.at/ki_prop/pdf/20 ... 0Chart.pdf as a reference for the recommended RPM range and if you're running 5400 RPM on a 1982 Evinrude 9.9 you're approximately 400 RPM above the max WOT range which, assuming the range cited is correct, is a much bigger issue and might preclude you from dropping to a shorter pitch as your slip doesn't appear to be that bad. I ran the same 16mph, with a 9" pitch and a 5000 RPM & your gear ratio through the calculator and you would have to see ~9% slip in order to not be over the 5000RPM recommendation with a 9" prop. I'd first find and double check your OEM RPM recommendations. When my prop was slipping 36% I was spiking 100-200 rpm over recommended, but the difference I saw with the same pitch once the cup was added was a drop of approx 400 RPM. Keep in mind this was with a 25hp engine - differences in a 9.9 will be different. The cupping service ran me $35 which is roughly half what the 4 blade looks like it will cost you. Let's face it, as the season goes on, boats only get 'heavier' ... they do not lose weight. Air becomes hotter in the Summer and that by itself hurts output on any normally aspirated motor a good 10% due to less dense air. Add in ethanol E10 fuels and we've already lost another 8 to 10% in output due to the lower combustion profile of that fuel vs. the previous MBTE-rated or non-plant based fuels. Add in any boat moored or stored in the water where growth/slime sticks to it ... and you've added more drag. For best results, one wants to run their boat and pitch their prop so that the OB runs no more than 200 to 300 RPMs off the maximum rated RPMs. IMHO to do so otherwise is just foolish. I can't tell you how many large V4 and V6 OBs I've seen with powerhead failures and when diagnosed, they all were setup to run in the low end of the operating range, well before the new owner added more weight and effects of the environment onto the rig. To me ... that "recommended RPM range" is the worst advice ever told/sold to the boating public. If/when looking at boats, if I even came across one running in the low end ... I'd just walk away, I wouldn't even consider it further as a potential boat to buy ... she's just one ka-boom away from engine rebuild or replacement. I will probably try to find a used 9" prop for cheap to see what kind of results I get with a larger load and/or more people like you recommend. Swapping props takes less than 5 minutes and will likely be worth it for this setup. This can hold me over for now until I move on to building a jackplate. I'm holding off on that until I get the boat more "complete". Don't have a lot more to do but would like to buy an aluminum hatch to finish the rear deck over the battery/gas area and install a few more small things which will likely add up in weight when it's all said and done. As to my motors WOT range, the label on the motor and in my service manual states that it is 4500-5500 rpms with the HP rated at 5000 rpms. For a 15hp it is 5500-6500 with HP rated at 6000 rpms. By that I am at a decent spot now as Im at the upper range by myself and in the middle with another person, however, the boat will only get heavier from here. I will be converting this motor to a 15 hp too so I'm curious how the theoretical extra 1000 rpms will affect anything, if at all. I was thinking with more rpms/speed the boat may ride up on plane better thus reducing drag and slip and possibly getting better than linear results. For sure, the max end of that RPM range does not directly relate to the "Red line" in your car - motors with the same internals & different carbs will have different max WOT recommendations - and running @ the low range isn't ever good for the motor. It sounds like the 9.9 and 15 share the same internals & the 15 has a much higher rating so the true mechanical RPM limits are much higher than what you're seeing at 5400. True. For my year, the difference between the two is 1) larger carb throat & jet, 2) "tuned" exhaust tube, 3) reed spacers. Really at the point I am at now, I need to go ahead and do the conversion before playing too much with props. If you have seen any of my other threads, I currently have a complete 15hp that I am trying to get running right. Thus, I have all of the parts for the conversion, however, I would prefer to get the 15hp running well before doing the swap so when I replace its parts with the ones from the 9.9 I have a working motor to sell. Currently, I am only at the point where I can do a carb swap (which is probably 75%+ of the gain) and actually need to do so to rule out a problem with the 15hp carb so I can move on to other checks.